I was the ONLY candidate to question the allocation of the one-time $4.66 million windfall from the sewer system sale and the BP settlement. I did not agree with using "dead uncle money" to resurface roads and questioned what happens next time the roads need paving and there isn't another "dead uncle inheritance" to pay the bill. At "Meet the Candidates," my opponent, Cookie Kennedy, claimed to have supported the citizen effort against the deceptive fire tax. Commission meeting minutes of 7/12/16 do not support her claim: "Commissioner Kennedy is standing behind the PSFRD. She stated it does not matter what a person pays for fire service..."
I not only attended Fire Commission meetings and offered comments, I also wrote a generous personal check to the Hoofnagle Legal Fund to help with lawsuit expenses. The new community center concerns me for a number of reasons. According to a Belleair Bee article (11/23/17), the lowest bid was $774,000...70% over the $450,000 budgeted. A better approach might have been to evaluate estimates on actual preliminary architectural plans before leasing land in Largo to move solid waste to make way for this structure. The parking spaces for this site do not begin to accommodate its planned use. With insurance, mowing/landscaping and other maintenance plus the cost for city employees to staff events, the $2,000 per year the City has budgeted for maintenance is not realistic either. The biggest question: Does IRB want to create competition for wedding and party business with one of its largest taxpayers, the Holiday Inn Harbourside, in addition to a number of other local restaurants? Perhaps Commissioner Wrobel's alternate plan for an open air pavilion warrants some further discussion. The community center is also why I am not in favor of the charter amendment on the upcoming ballot. The City is asking voters to grant them permission to put the remaining $100,000 left in Emergency Reserves from the Sewer Fund into the General Fund. My fear is that it will be used to cover the community center shortfalls in both initial construction and ongoing maintenance. There needs to be a lot more discussion with residents before the community center project moves forward, especially since it appears that a large percentage of residents are NOT in favor of it...AT ALL! Unlike my opponent, I am not excited about spending a big chunk of your tax dollars so residents can gather for "needlepoint and bridge," as she stated on Candidates Night. 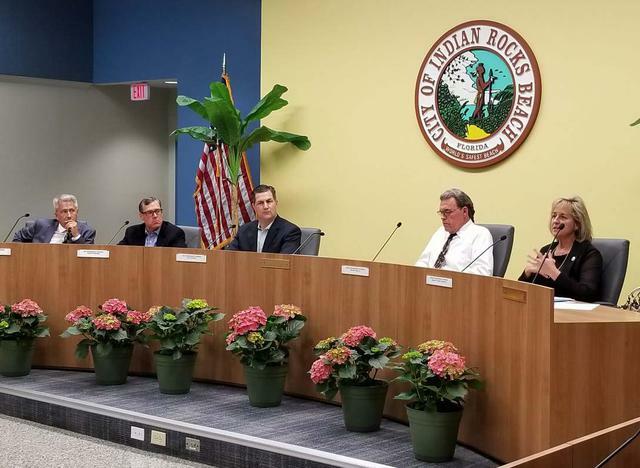 "New Indian Rocks Beach Community Center Could Be Delayed,"
This is possibly the most crucial issue we face yet the discussion at commission meetings does not reflect the urgency. The commission had not even seen the wording on the easement when some commissioners urged residents to sign it! At "Meet the Candidates," I said I, as a beachfront property owner would never sign the perpetual easement being requested. Evidently, the majority of the attorneys for the condo associations in the affected areas agree. This easement gives the County permission to do much more than add sand on the seaward side of the beach. It allows construction of berms and dunes and the removal and placement of trees and plants in addition to "other erosion control and storm damage reduction measures" that aren't even specified. It also grants the County the ability "to patrol." This is a land grab, plain and simple, and a solid plan of action, not just ineffective discussion, needs to go into motion YESTERDAY! Former IRB Commissioner Jose Coppen has pleaded with our Commission and members of the Big-C yet no meaningful progress appears to have been made. At the February 13, 2018 IRB City Commission Meeting, I requested that this issue be added to every upcoming meeting agenda until the issue is resolved. Over the last 20 years, I have fought for our property and water rights at too many commission meetings to mention. 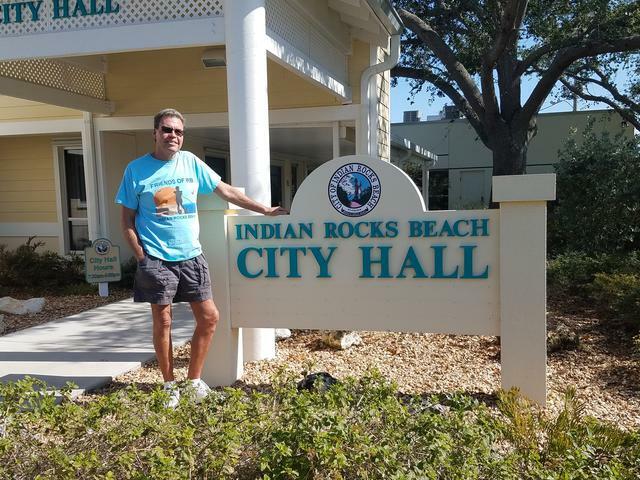 In Nov. 2014, our Indian Rocks Commission decided 3-2 to write a letter to the Florida Fish and Wildlife Conservation Commission (FWC) to close all basins in Indian Rocks Beach to seasonal watersports. My opponent, Cookie Kennedy, sided with the majority and formed the 3rd opinion that tipped the scales toward closure. This move authorized the FWC to move forward with closure of even more basins than it had requested. This action triggered two citizen lawsuits against the FWC. Eventually, the citizens managed to "claw back" one of the bays. I'm more than surprised the Commission didn't realize the magnitude of their decision and make triple sure residents were fully informed about the implications of allowing FWC to regulate our waters. These regulated basins can face additional restrictions on dock building and water use in future years if FWC's current policies become more restrictive. Other neighboring cities escaped with much less regulation and IRB should have as well. I was in attendance and spoke at the "blue shirt" standing-room only meeting, defending our rights to recreate on our waterways! Still have my blue shirt and am not beyond dusting it off as your Mayor! If you attended "Meet the Candidates" at City Hall on Jan. 24, you saw me, DON HOUSE, respond to every question directly and honestly with answers supported by facts. Political advertisement paid for and approved by Donald House, Jr.